I felt slightly jealous of some of the ultra-cheap typewriter finds that Ted and and a few other typewriter lovers recently posted about. Or at least until…. The Adler…. It looks a little worn an beaten, but may prove to be an excellent typewriter yet. That’s right. 12 typewriters. That makes them $3 each. The photos did not provide much in the way of information on these machines, as the seller had basically just crammed whatever he could into three photos without attempting to make any effort to display what he had. As such at least 4 of the typewriters were going to be a bit of a ‘lucky dip’ selection. 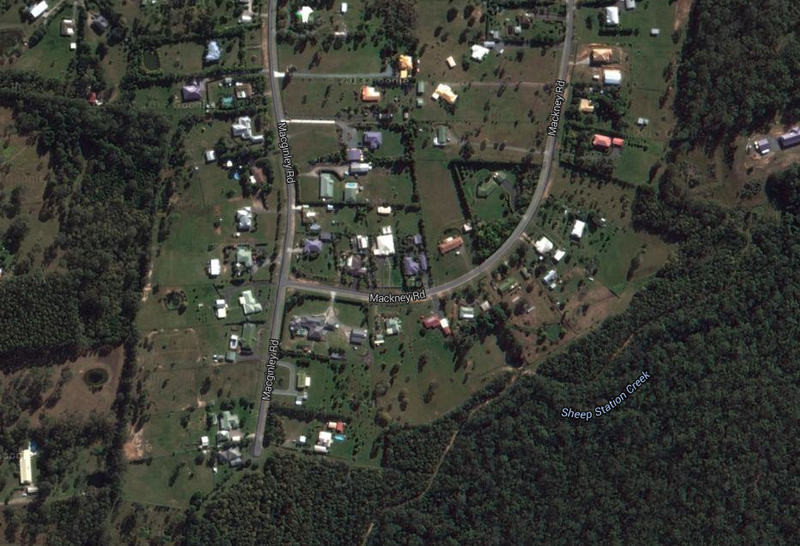 But I did spot a very familiar case on one, that I was certain would make this worthwhile. The problem is, that my collection had already burst at the seams as it was. I just simply don’t have storage space to put them. Suddenly adding another twelve to the mix is going to be interesting. The morning that the auction ended, I went over and collected the horde of machines and loaded them into Ruby the Exxy with the assistance of miss Jane. It was essentially a deceased estate, as these machines belonged to the seller’s late father. “He was trying to fix them and sell them” the seller told me. “But I think he was asking too much for them or something”. The seller was ex-army. He struck me as the kind of guy that would have been a ‘plantie’, an engineer that would operate or maintain heavy machinery used in construction. His car was adorned with army stickers, and the less tasteful car ‘breasticles’, a variation of ‘Truck testicles’ that looked like breasts hanging from his tow-bar. Either way, the collective of machines were both filthy, and in disarray. A couple of the machines were flat-out just nasty, with wasp nests and rust giving the collection a texture that made one feel compelled to get a tetanus shot just for handling them. 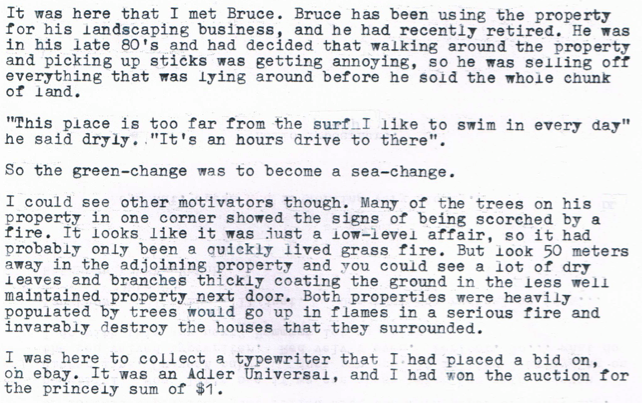 I had been emailing both John and Steve about these typewriters, and we’d agreed grab whatever we particularly wanted the most from the collection of machines. As I drove out from the seller’s house, I called Steve and asked him if he would like to take a look. I laid out the collection on Steve’s front lawn, and we were soon going over each machine with something of a cursory inspection. John had already expressed that he wanted the big Remington standard, and I wanted the particularly green coloured typewriter that I had spotted as just a case in the photos. 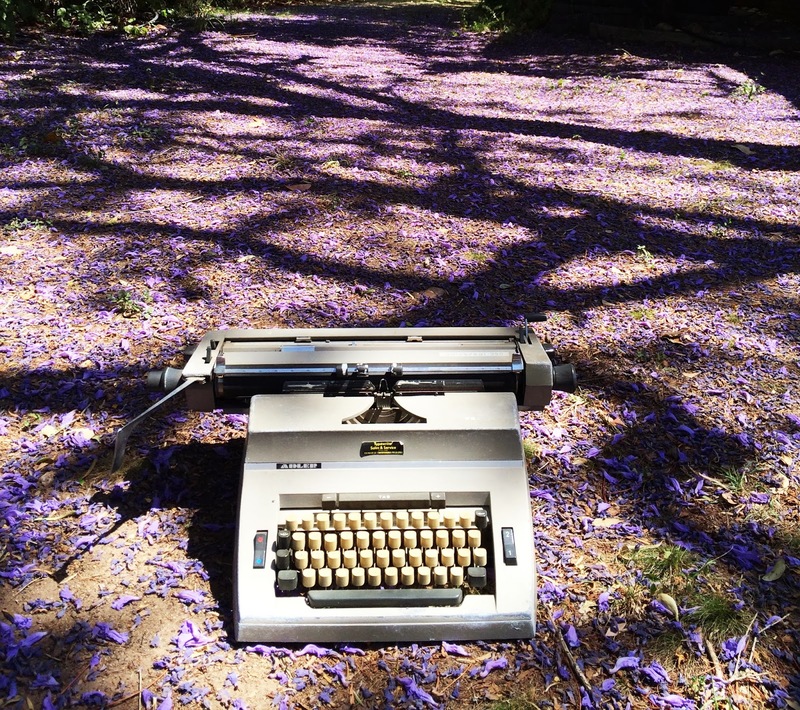 More typewriters growing from Steve’s lawn? No prizes for guessing which machine I gave my immediate preference to. As you can see, there’s also a box of Adler branded ribbons. I have no idea as to what condition these are in, but I’m curious to find out. There was really only two machines that I at this stage feel are irretrievable. The rest of them I am certain can still have another life yet. But I may find some disasters await me when I start to have a much closer look. Either way, at $3 each typewriter, there’s really nothing to cry about. 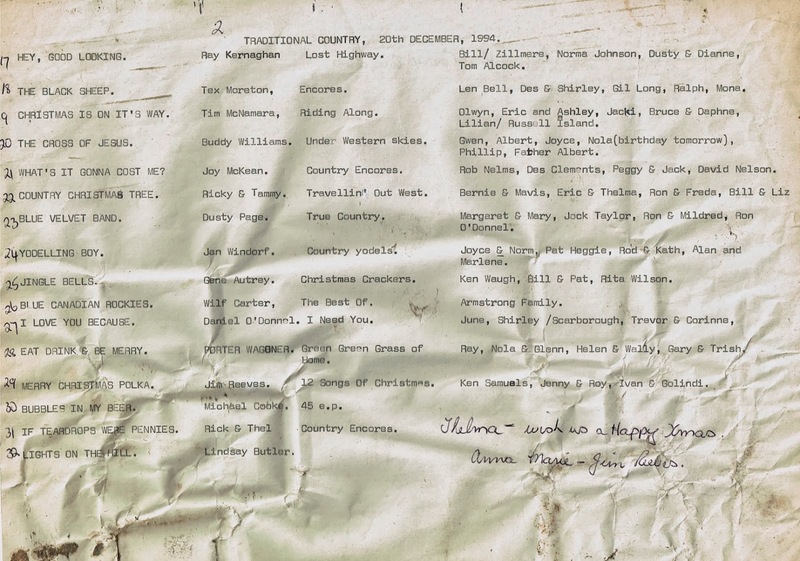 The big Olivetti Studio even had its cover, and interestingly a list of songs that looked like it was for a country music christmas celebration. I immediately had the mental image of some RM Williams clad man with an Akubra hat on, tapping out the list of his favourites on that big ol’ Olivetti. Trouble is that the machine’s design had ‘space age’ written all over it, so far as it even had a ‘techno’ typeface. As such it just didn’t seem to be the right typewriter for the part. Not to mention that a woman had signed off on the list with some christmas wishes. Not that women don’t cruise around wearing RM’s and big hats. Fragments of the past. Oh… hang on, there’s some familiar names here. Steve grabbed out of the collection an Olivetti 32, and a Underwood 310. I’m certain with a bit of a clean the 310 would come up looking quite beautiful with its striking cobalt blue ribbon cover and trim, and vibrant white shell. I think he’s got a worthwhile machine there. We loaded the 10 other machines back into the car and Jane and I made our way home. I’ve now got 10 more typewriters that need assessing and, well, probably urgent attention, sitting in my shed. 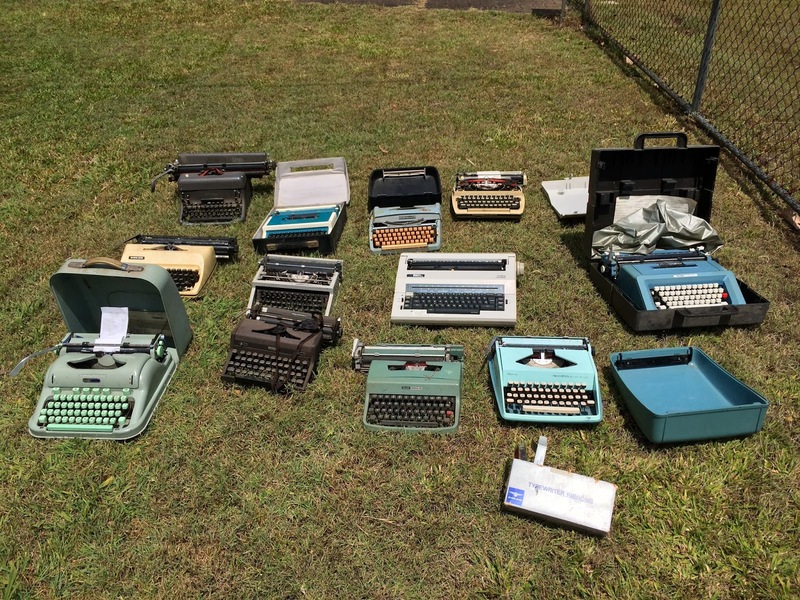 That’s 11 typewriters in total this week from just the local countryside. It must be fruit-pickin’ season. ← From Melbourne to Ballarat – a town of the lost and found. Wow, what an incredible haul, congratulations! Looks like the “dirt-cheap typewriter bug” has slipped through quarantine here in Australia. Impressive score, sir! The QDL, Hermes 3000, and the Remington alone are an absolute coup, even if the rest of them can't be salvaged. Although, I think you'll manage to save a few of them by the time you're done. Nice harvest! I'd pay that price for the QDL only. Is that a Dora/Underwood in the second row any good or would it end up as a parts machine? And any relation to the name on the song list? congratulations! wohoo…you are one lucky guy!!! excuse me, I gotta pick up my jaw! my cheapest typer was $25, an Olympia traveler de luxe, and it was a spoilt one too. Oh, you do love your Olivettis! I think both the typewriters he had were working, and just needed a clean and a lubricant. Tell me about it. I need more space now! Oh, I've even revised my estimate of unrecoverable machines down to 1 now. So I'm pretty sure I will. Incidentally the H3K is working and just needs a big clean. I think $3 has got to be some kind of record for a H3K. The Remington also types quite nicely. Actually I think that bright blue Remington quiet-riter is going to be the surprise piece of the set once I've done some work to it. I know. John has expressed interest in that QDL. I might have to arm wrestle him for it though (but I'd probably lose). The Dora is actually just missing its lid. Incidentally, I have a lid spare. So, scratch one more off the non-working list. I will have another typewriter working yet! Why thank you! Well, I can't say that you ever really go wrong when you buy an Olympia. Even if it doesn't seem to be working at first, it's never far off. Good that you can put that Dora into use. I'm quietly 😉 looking for someone with Dora or Underwood spare parts machine as I don't have the heart to nick a key from a perfectly working typewriter. Or maybe I'll find broken one dirt cheap. That is an awesome little treasure trove! Very nice! Congratulations on the great finds. If your experience with Adler matches mine, I am sure you will get a fantastic typer from the Adler. My J4 (except for my Underwood) far surpasses all my other machines for snappy and smooth. It'll put all my Olympias to shame and Hermes. Well, forget about a Hermes beating the J4. An H3k is a fine machine, but not nearly as snappy and smooth as my Adlers. I could just hear my wife if I happened to come home with 12 typewriters. Congrats! It's great that they ended up with you guys; at least it gives them a good chance of being restored to working condition. Haha, afirmative. Like a kid in a candy shop I was that morning. Yeah! Now… to find the time to repair them (and store them). The QDL is… well… workingish. But it is very different to my other Royals. John has shown an interest in it (as I said) but I'm not sure he'll want it when he sees the real condition of it. I've got a Gabby 25 that – after being used for experiments, has been a brilliant machine to type on. This guy has a long way to go before it is in working condition, but I'm excited to try as I'm sure it will be quite a learning experience. Oh, I think so. I even have some interesting ideas for the borderline recoverable machines. Should be fun! Do you have a steel umbrella? They really freakin' hurt when they hit you. Very pithy Scott, you summed up the Australian dream/nightmare in just a few words, not big enough to be a farm but too big to be manageable as any thing else. Poor Dad, works all week and then works all week-end! And some of them never wake up to it all, riding around on their ride-ons…..
Well, speaking from experience here. I hate mowing the lawn at my house! And the ride on is busted. Ha ha. It'll be more amazing once it is finished. Oops, forgot the “n”. [Calls himself an editor, pshaw…]. Should read: 'No love for …' etc. Oh, on the contrary… It was the first one I grabbed!